In 2014 my colleague Ross Hyams and I developed a series of 12 short videos for use in the Monash Law 1st year law program. We were fortunate enough to secure a small pilot project grant, which helped us pay for a technical and production assistant, Sam Blashki. The three of us worked together to put the series together, with the aim of attempting a partial ‘flip’ of the 1st year introductory unit, Foundations of Law. The university then asked us to give a staff seminar, which was captured on video. At the time we delivered the staff seminar, we had not quite anticipated that the video would ultimately be up for public viewing, but now it is available all to see! I only mention this, because it is a very ‘rough’ presentation, we were unscripted and we talk over each other a bit. It is over 50 minutes, I think the interesting part is from 4.10 to about 17 minutes, that’s enough to get the idea! So yes, I had to overcome my fears and appear on video, and guess what? It wasn’t too bad. Ross and I are not all that technically competent, but we are happy to try new things, and can use a video camera, we learnt to do basic editing on imovie, and Camtasia (which we did not end up using). Sam actually did the filming and editing, sourced the images, got permissions, edited the images into the videos etc and even uploaded to youtube on a private channel for us. We embeded the youtube links into to the unit Moodle page, and placed them along side the information about the week’s readings. We worked with existing lecture notes, we selected basic parts of the lectures which needed to be taught, but were basic and not always interestingly conveyed in class (what are the parts of parliament, how are statutes made, the reception of British law etc). We use the time released from lecturing, to engage in more discussion, activities, case studies, and group work. We also designed little quizzes that can be used on the unit page, or in class, for students to check their comprehension of the content. We filmed with a normal video camera, on a little tripod, in the same place, with the same background, and same intro and conclusion (‘Hi, today we will be talking about …’ and ‘so today we talked about x, y and z. see you next time’). Each video is around 10 minutes. There is no explicit link between each episode, so they do not have to be watched in order. If the reading guide/class timetable changes, the order of the videos can be swapped around. We refrained from mentioning page numbers or specific books, in case new editions come out, or lecturers change texts. Those details are on the reading guide and added onto the unit page. Here is the 13th video, the short introduction to the project. 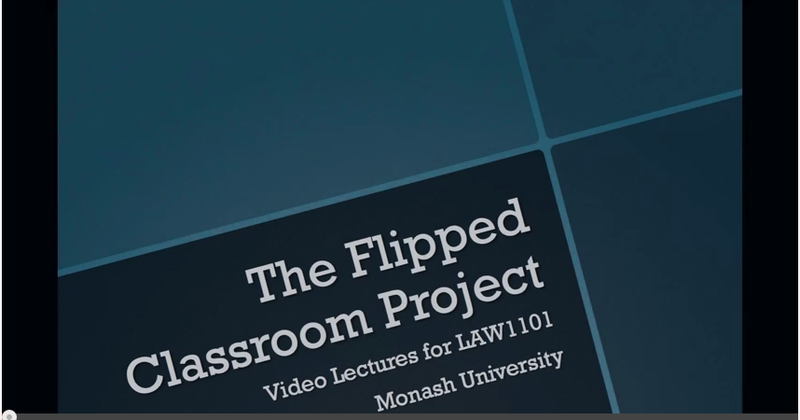 Monash wrote up a little piece on the project; Flipping the Classroom Law Style. If you are interested in exploring the ‘flipped’ or ‘blended learning’ approach to law classes, check out the great materials at LegalEd Web or look at Can “Flip Teaching” Happen in Law School?. I found just googling flipped law class gives plenty of ideas. I also audited UNSW’s Mooc Learning To Teach Online. I recommend it to anyone thinking about using videos to support blended learning (but you don’t have to wait for it, I’m not sure when they are running it again). If you want to do a sample video, to see how it works, just take a short video on your phone, or tablet, and edit it. Or don’t even edit it. It doesn’t have to be perfect, after all we are all imperfect in the lecture theatre. I’d love to hear about your experiences with podcasts and videos that support classroom teaching, please leave your comments below. This entry was posted in Legal education, presentations and tagged academics, law students, learning. Bookmark the permalink.